A masked, bead-bedecked and boa-clad crowd celebrated the Animal Welfare League of Alexandria celebrated the third annual Mardi Growl. ALEXANDRIA, Va. – The United States Patent and Trademark Office was transformed into New Orlean’s French Quarter as the Animal Welfare League of Alexandria hosted the third annual “Mardi Growl” party Friday night. A masked, bead-bedecked and boa-clad crowd enjoyed “Howlicanes” and hors d’ouvres by Bittersweet Catering in Alexandria, Va., while listening to live jazz by Blu Neffu. Rep. Jim Moran (D-Va.) stopped by to bid on a few silent auction items and rub elbows with his fellow animal-loving constituents. 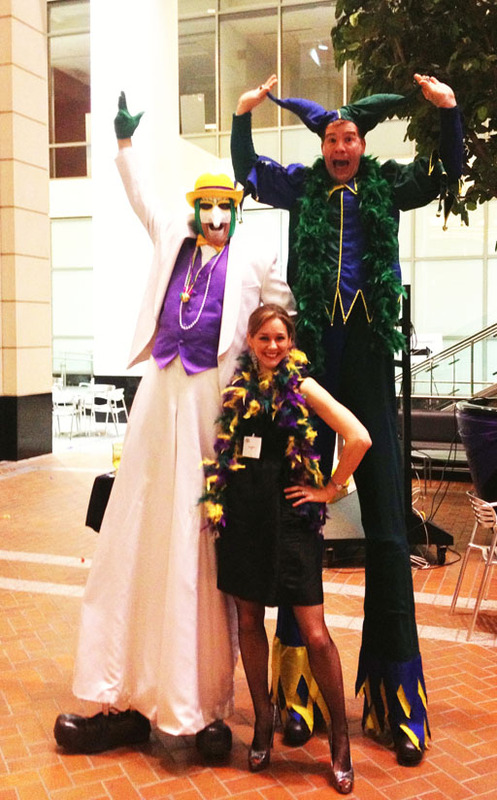 The event, AWLA’s largest annual fundraiser, included jesters on stilts, caricature artists and a packed dance floor. To learn more about the Animal Welfare League of Alexandria check out their website www.alexandriaanimals.org.